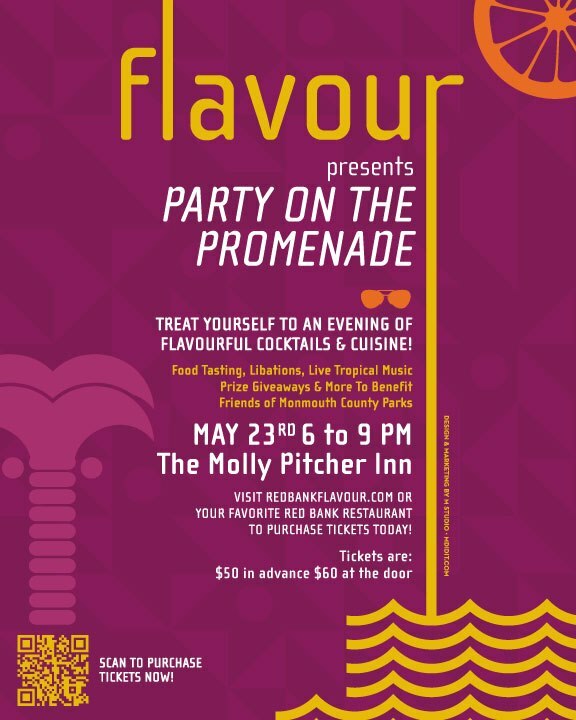 Red Bank Flavour will host a culinary event on May 23 at Molly Pitcher, featuring 20 local eateries and benefiting Friends of Monmouth County Parks. More than six months after Hurricane Sandy, the Red Bank Flavour Culinary Alliance and the Molly Pitcher Inn announced a May 23 fundraiser and culinary event, “Party on the Promenade,” in support of the non-profit organization Friends of the Monmouth County Parks. With the Monmouth County Park System having sustained an estimated $9 million worth of damage from Hurricane Sandy, Red Bank Flavour and the Molly Pitcher Inn are eager to show their support of the non-profit organization through the “Party on the Promenade” event. Friends of the Monmouth County Parks, whose initiatives and goals include the preservation of historical and natural resources, as well as access to recreational opportunities for urban youth and activities for individuals with disabilities within the community, will be in attendance. In distinct Flavour fashion, Red Bank’s chefs, restaurateurs and proprietors, will welcome culinary enthusiasts and wine aficionados from around the state to sample the town’s unique flavors and finest cocktails, including exclusive offerings from Hendrick’s Gin. In addition to culinary and cocktail tastings, “Party on the Promenade” will take advantage of the Molly Pitcher Inn’s recently expanded promenade to offer live steel drum music and riverfront views. Prize giveaways and dancing will round out the affair. Party on the Promenade will take place from 6:00 p.m. to 9:00 p.m. on Thursday, May 23 at the Molly Pitcher Inn and feature samplings from 20 Red Bank eateries. Tickets for the event are $50 in advance and $60 at the door. A portion of proceeds from the event will benefit Monmouth County Friends of the Parks. For more information about “Party on the Promenade,” including a list of restaurant participants, or to purchase tickets to the event, please visit www.RedBankFlavour.com. Launched in the fall of 2011, Red Bank Flavour is a culinary-driven campaign that spotlights Red Bank’s bustling restaurant, bars, lounges and eateries. It encourages everyone from bar and restaurant-goers, foodies, wine enthusiasts and farmers market fans to get a taste of Red Bank’s one-of-a-kind Flavour. The campaign features nightly specials and promotions, special events, fundraisers and more. Red Bank Flavour is part of the Red Bank RiverCenter, For additional information, please visit www.RedBankFlavour.com.